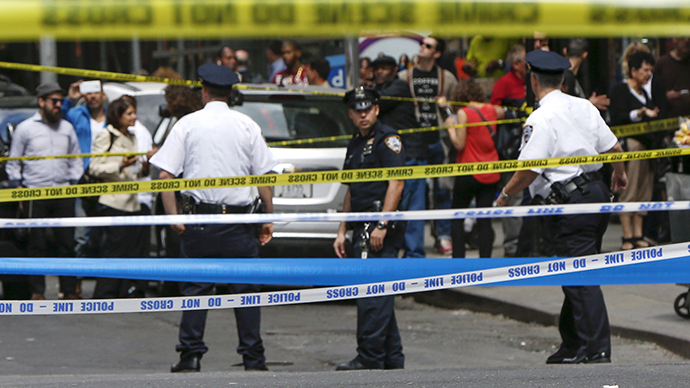 A hammer-wielding man suspected of attacking at least four people in New York City this week has been shot by police officers in midtown Manhattan. Two cops with the New York Police Department were following a man on Wednesday morning who matched the description of an individual accused of being behind a wave of recent hammer assaults when the suspect engaged the officers, prompting one of them to open fire. The officers were trailing the man down Eighth Avenue when the suspect “immediately pulled out a hammer,” Police Commissioner Bill Bratton said on Wednesday, and attempted to assault the female officer with the “claw end” of the tool. “When he turned around he pulled out the hammer and violently started swinging the hammer at the female officer,” Manhattan Chief of Detectives William Aubry explained to reporters. Four shots were fired by her colleague, Bratton said, striking the suspect twice and leaving him in critical condition. The incident unfolded at around 10:00am in broad daylight in the middle of a busy midtown intersection only a few blocks from Madison Square Garden in the presence of onlookers and NYPD cameras. Authorities say four people in New York City were attacked by a hammer-wielding man on Monday during a six-hour crime spree. Police released surveillance camera footage showing the suspect the following day, with the NY Post identifying the man as 30-year-old David Baril, according to unnamed law enforcement sources. The suspect was undergoing surgery at a NYC medical center as of Wednesday afternoon, and CBS News reported that the officers involved did not suffer any significant injuries.